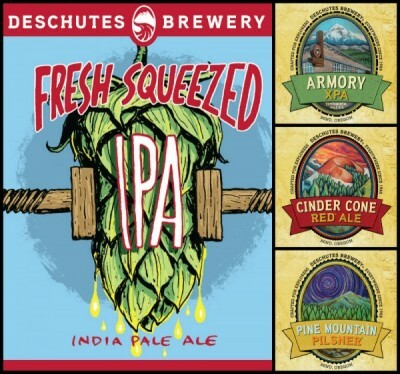 (Bend, OR) - Craft beer fans will have even more styles to enjoy from Deschutes Brewery in the coming year, including the return of old favorites and the release of brand-new experiments. In addition, new market launches scheduled throughout the year are kicked off by a week-long series of events in Ohio and Kentucky at the end of this month. One of the largest changes to the beer menu for 2014 are three 22-ounce mainline offerings available year-round starting at the end of March. Distributed primarily in the Mountain and Pacific regions, these beers includePine Mountain Pilsner, Armory XPA and the classic Cinder Cone Red (yea! It’s back!!). After a successful launch in 2013, the brewery’s “session style” Deschutes River Ale will now be available in 12-packs for fans in Utah and the Pacific Northwest. And there’s more – click here for a complete calendar of release dates and beers. Geographic expansion starts off this year with a launch in Ohio and Kentucky beginning January 24. In April, the brewery will round out its presence in Pennsylvania by launching in the Pittsburgh area – greater Philadelphia started receiving Deschutes beers year-round last summer. Later in the year, fans in Wisconsinand Michigan will also be able to find their favorite Deschutes Brewery beers in their home states bringing the total number of states at the end of 2014 to 27. Founded in 1988 as a brew pub in Bend, Oregon, Deschutes Brewery is known for brewing a diverse line-up of award winning beers including the popular Black Butte Porter and Mirror Pond Pale Ale. In 2008, the brewery opened a second pub in Portland’s Pearl District. Deschutes Brewery now ships beer to 23 states and around the world from its main brewing facility located on the banks of the Deschutes River. To find out more, visitwww.DeschutesBrewery.com or join the conversation on Twitter (@DeschutesBeer) and Facebook(/Deschutes.Brewery).